Sunnyside Dru: no tractor. no rototiller. We don't own either a tractor or rototiller. Both are expensive to purchase, burn fossil fuel and are noisy. While federal regulations measure and restrict the amount of particulates that can come out of cars and trucks, no such regulations exist for lawn mowers and rototillers and the older tractors. As we examine our farm practices, we try and produce as much as we can with as few inputs as possible. 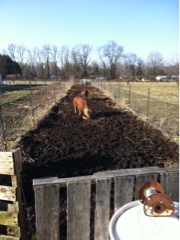 When it comes time to clearing our planting areas for vegetables, we use pig power. The original bush hogs, they live to eat roots and anything growing above the surface. Brambles too! So when it is time to clear out large swaths of land the pigs go in. Sometimes it has real fencing, other times just a couple strands of electric wire. And then? Clear as clear can be. 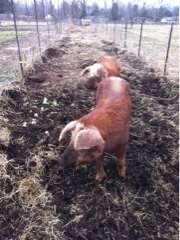 Happy pigs, happy farmers and later in the season the best pork ever. And as the photos show, in just a few days clear ground!